10. Satan sets up counterfeit churches to fill the world with false doctrine. A.	Jesus Christ built His church at His first coming (Mat 16:18) which is the church of God (Act 20:28). 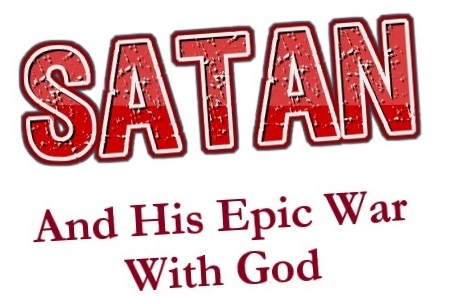 i.	Satan wants to be like the most High (Isa 14:14). a. God's Jews met in synagogues (Mar 1:21). b.	Satan's Jews (Joh 8:44) also meet in synagogues (Rev 2:9; Rev 3:9). ii. Since God has a church, then Satan needed a church too. i. The religion of the Roman Empire had been paganism until the 4th century AD. ii. Christianity had been spreading through the empire since Christ ascended into heaven. iii. The Roman Emperor Constantine allegedly converted to Christianity in 312 AD. a. The Roman Catholic Church was founded by Constantine in 325AD at the Council of Nicea. b. He called all the bishops of churches throughout the empire to an ecumenical council to create a consensus in doctrine among the churches. c.	The majority of the bishops did not attend the council. e.	This was the beginning of Roman Catholic Church which was under the control of the emperor of Rome, Satan's sixth world empire. iv. The Roman Catholic Church is described in detail in Rev 17. (i)	The "many waters" are "peoples, and multitudes, and nations, and tongues" (Rev 17:15). (ii)	This is true of the Roman Catholic Church; she is in nearly every country in the world. b. The kings of the earth fornicate with her (Rev 17:2). (i)	Throughout history, political leaders have been in bed with the RCC. (ii)	At times, kings controlled her, and at other times she controlled them. (iii)	Even to this day the Vatican and the Pope are highly respected by the rulers of the world. c.	She rides upon the beast (Rev 17:3). (i)	The RCC rose to power on the back of the beast, the Roman Empire. (ii)	This is why she was protected and was able to come to power. d.	She is full of names of blasphemy (Rev 17:3). (i)	The pope is called "Holy Father" which is God's name (Joh 17:11). (ii)	Mary is called the "Mother of God", which is blasphemous paganism. e.	She is beautifully arrayed and decked with gold and precious stones (Rev 17:4). (i)	The buildings of RCC decorated ornately and colorfully. (ii)	The Vatican is estimated to be worth between $10-15 billion. f.	Her name is MYSTERY, BABYLON THE GREAT, THE MOTHER OF HARLOTS AND ABOMINATIONS OF THE EARTH (Rev 17:5). (i)	Satan reincarnated the Babylonian mystery religion in the Roman Catholic Church and simply changed the names. (ii)	The following are examples of how the RCC is reincarnated Babylonianism. (iii)	The ancient pagan statues of the mother and son became Mary and Jesus. 1. Mary worship replaced the pagan mother goddess worship of the Babylonians, Greeks, and Romans. 8. God hates pagan Mary/Queen of Heaven worship (Jer 7:18; Jer 44:19). 9. Mary is not a goddess to be worshipped (Mat 12:46-50; Luk 11:27-28). 3. Jesus Christ is the only head of the church, not the imposter pope (Eph 5:23). 3. There is no special class of priests in the NT church; all church members are priests (1Pe 2:9). 4. It is wicked to forbid men to marry (1Ti 4:1-3). 1. The "unbloody sacrifice" of the mass did not originate in the Roman Catholic Church. 3. Christ instituted communion which is a remembrance of His sacrifice, not the sacrifice itself (Luk 22:19). 4. Christ was only offered once for sins (Heb 10:10-14). 1. The rosary was another pagan custom adopted by the Roman Catholic Church. 6. Praying vain repetitions is pagan (Mat 6:7). 1. Purgatory, like nearly every other belief and practice of the Roman Catholic Church, does not come from the Bible, but from Babylonian paganism. 5. The wicked go straight to hell when they die where they will spend all eternity, and prayers will do them no good (Luk 16:22-23; Mat 25:46). 3. The cross was the instrument of Christ's suffering by which He atoned for the sins of His people (Col 1:20). a. It is not be worn or worshiped. b. Reference to honoring the cross in the Bible refer to honoring the work that Christ did for us on the cross (1Co 1:18; Gal 6:14), not to the cross itself. 3. God alone should be worshiped (Mat 4:10). 4. Relic worship is idolatry. g.	She is drunken with the blood of the saints (Rev 17:6). (i)	The RCC brutally persecuted, tortured, and murdered millions of Christians throughout the dark ages and especially during the Inquisition (read Foxe's Book of Martyrs). (ii)	There is no organization on earth that fits this description better than the RCC. h.	She sits on seven mountains (Rev 17:9). (i)	Rome is known as the city that sits on seven hills. (ii)	The headquarters of the RCC are in Rome. i. She is the great city which reigns over the kings of the earth (Rev 17:18). (i)	At the time of John's writing, Rome reigned over all the known world. (ii)	The woman in Revelation 17 is Satan's church, the Roman Catholic Church. v.	The Roman Catholic Church has served at least three major purposes in Satan's war with God and his people. a. It has been substituted for Christ's church in the minds of billions of people. b. It has filled the world with heretical doctrine and idols. c.	It has viciously persecuted the saints. i. The Roman Catholic Church is the Mother of Harlots, which means she has harlot daughters. ii. These daughters are the Protestant "churches" that spawned from her such as the Lutheran, Presbyterian, Anglican, Methodist, etc. "churches." iii. All of these "churches" were either started by men who were Catholics (Lutheran, Presbyterian, Anglican) or by men who broke away from other Protestant churches that were started by Catholics (Methodist, etc.). e.	Church and State merger. f.	Incorporating pagan holidays into so-called Christianity. v.	The Protestant "churches" have served at least three major purposes in Satan's war with God and his people. a. They give people a false alternative to the Roman Catholic Church which appears to most non-Catholics to be true Christianity. b. They are Satan's imitation of God's true reformed church (Heb 9:10). c.	They make it very difficult for God's people to weed through all of the false churches to find His true church. 11. Satan orchestrates bloody persecutions by these false churches. A. The Roman Catholic Church was drunken with the blood of the saints and martyrs (Rev 17:6). i. A short survey of Baptist church history will show that God's true churches such as the Waldenses, Albigenses, and Anabaptists, suffered terrible persecution from the RCC throughout the middle ages. ii. These persecutions caused these churches to flee to the mountains of Europe, but they were not able to destroy them. B. Once the Protestant churches were organized, being daughters of the great whore, they too persecuted the saints. i. The Baptists were persecuted by both Catholics and Protestants after the reformation. ii. Even in America Baptists were persecuted by Protestants. iii. Eventually, religious freedom and the separation of church and State were established in America, and God's saints had rest for a while. iv. See series on Baptist Church History: https://www.excelsiorspringschurch.com/baptist-church-history. C.	Satan lost the battle of persecution again.